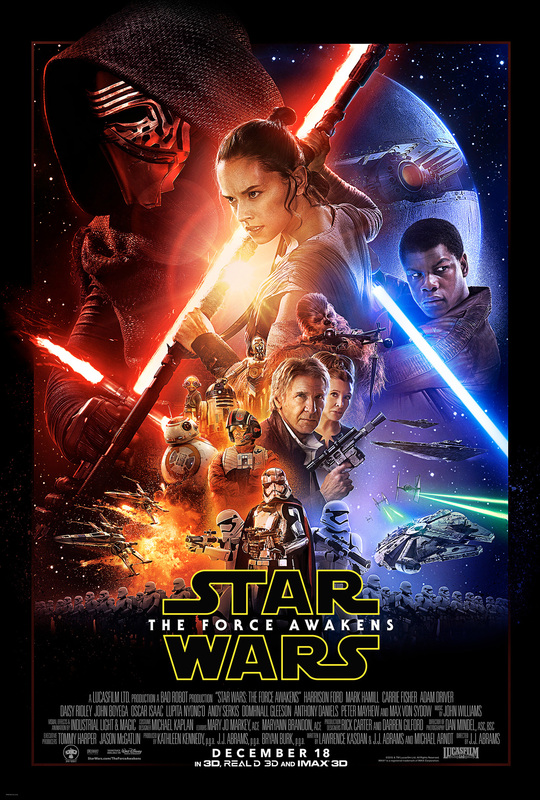 Star Wars: The Force Awakens is a blockbuster movie. OKLAHOMA CITY – Okay, so I realize that for many reading this, the Star Wars series is the greatest series in movie history. I further realize that many fans probably like the Star Wars series as much or more than they like their own children. And these people really, really love their children. As such, I don’t see any point in trying to convince anyone that Star Wars: The Force Awakens isn’t super amazingly awesome and fabulous. That would be like me trying to convince a parent that his child isn’t wonderful, except even more so. All I want to do is simply offer some of the things I liked and didn’t like. But before doing that, a bit about my background. I am not a die-hard Star Wars fan. I do love the originals, but only the de-specialized editions. 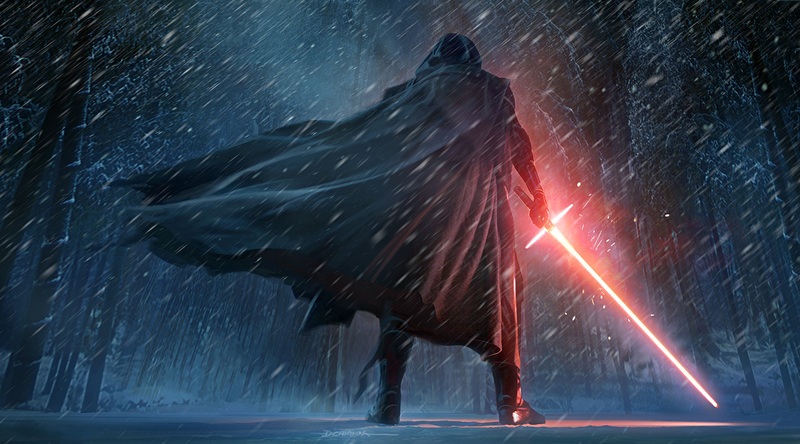 Actually, I really love the de-specialized originals….on the other hand, I can’t sit through the prequels. I don’t think I have to say why. The point is, I’m not a rabid fan, but I do like the craftsmanship and narrative of the originals, and with The Force Awakens, I was hoping for something great that would set the movie industry on notice the way the original trilogy did. I wasn’t expecting much, though, for two reasons. 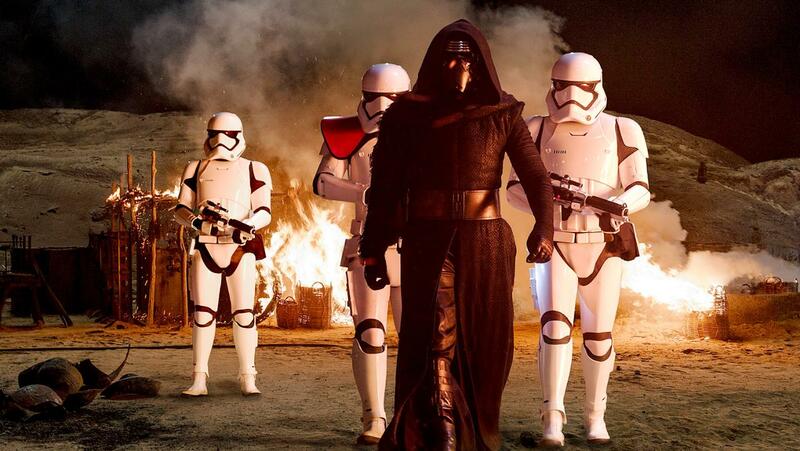 The New Darth Vader looks cool. First, JJ Abrams has a history of making mediocre movies. His work tends to be long on flash and short on depth, and I didn’t think he would suddenly change that. Second, after a groundbreaking movie appears, it is very, very rare that even one sequel/prequel can truly live up to the original, and it becomes even rarer as the series progresses as later entries often prove to be worse and worse. For example, Aliens was somehow able to match the greatness of Alien, but the following entries got worse and worse. Same thing for the Terminator series. Same thing for the Godfather series. Indiana Jones, Lord of the Rings/Hobbit, Spider-Man, Ironman, Taken, Pirates of the Caribbean, Transformers, Back to the Future, Jurassic Park, Jaws – in all these cases, the first entry is considerably better than the rest (even if some of the rest are still pretty good as in the Back to the Future and Indy series [of course not including the last one, Indiana Jones and the Nadir of all Nadirs Ever]). So, considering the trend of sequels not living up to the standard of the first, I figured odds were The Force Awakens wouldn’t either. Important note: there are three definite instances where this sequel rule doesn’t fully apply. 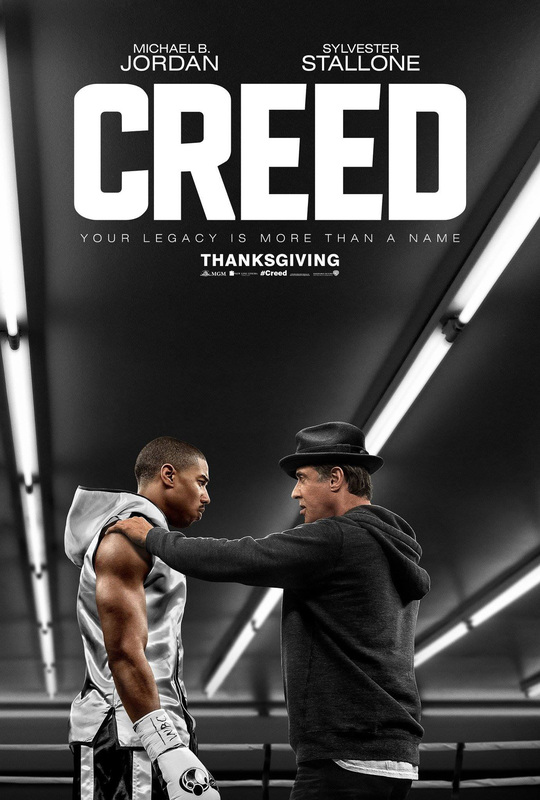 Creed is a movie starring Michael B. Jordan and Sylvester Stallone. First, the Rocky series. I think the latest Rocky movies (Rocky Balboa and Creed) have been a strong trend upward from the low point of Rocky V, proving that series can be good, bad, and then good again. 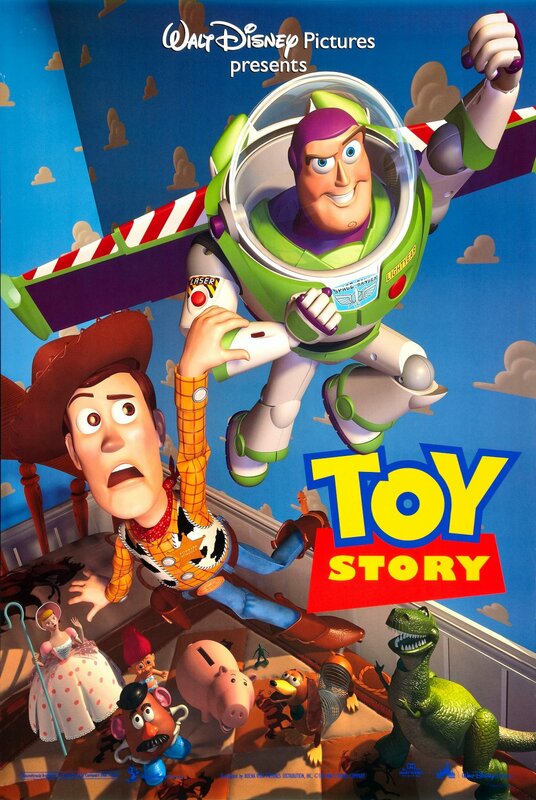 Toy Story is a movie series produced by Pixar Animation studios. Second, Toy Story – all three movies have been stellar, making it the one series that has completely bucked the sequel trend. So far…..
Third, the Fast and Furious franchise has been nearly a complete reverse of the trend. The first movie was okay, but it wasn’t very good, and then 2-4 went from bad to worse. And then, out of nowhere, someone threw The Rock into the mix and Fast Five was amazing. Like, it actually almost made the series somewhat respectable. 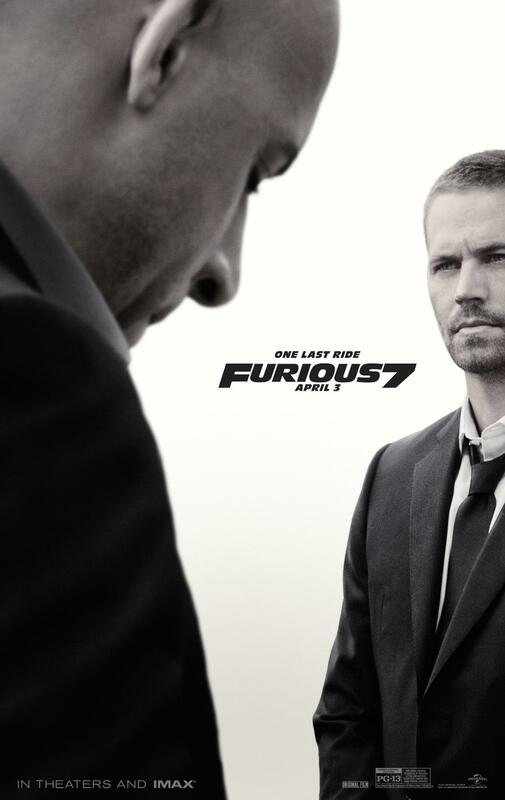 6 wasn’t very good, but after the tragic passing of Paul Walker, 7 came back with a vengeance, cementing the Fast franchise as the one movie series that completely reversed the sequel trend. Anyway, so there’s all that, and now I’ve rambled away from the topic. Hopefully my digression has not reached the point of enormity (in the proper use of the word enormity)!!!! Time to let these coruscations abate and get back to more topical ones. So, The Force Awakens…unfortunately, I think both trends of JJ Abrams making mediocre films AND of sequels not living up to an original standard are alive and well here. While it is better than the prequels, it is still not what I was hoping for. And NOW – without further ado, here are some things I liked and didn’t like about the film. What a cute little guy. I LIKED BB-8. The new robot is easily my favorite part of the movie. He’s really cute and stuff. 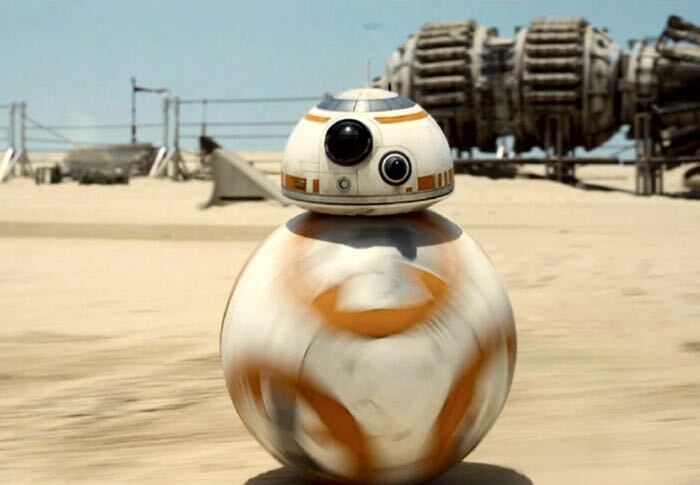 I DIDN’T like that all the characters called him “BB-8” all the time. It seems like they would naturally shorten that to “BB” kind of like R2-D2 gets shortened to R2. I LIKED the ending. Like, the very last scene of the whole movie. That is easily my actual favorite part with BB-8 being second. I LIKED some of the cinematography. Abrams is good at flashiness, and that include getting some really attractive shots. Naw bruh, I ain’t gonna cut myself. I be gettin’ savage on peeps all day long with this mother. I DIDN’T like the silly new lightsaber. I didn’t like it in the trailers, and I didn’t like it in the movie. It seems stupid to have two energy blades sticking out of the handle that would potentially stab the user. But whatevs. I LIKED the new bad guy. Cool character, interested to see where this might go with a good director. I DIDN’T like the fact that the film is, to a great extent, a compilation of beats/elements lifted directly from the original series. Sure, seeing Han Solo, Princess Leia, another Death Star (Starkiller Base or whatever it’s called), another eager and earnest hero learning to use the force in Rey, the Millennium Falcon, R2-D2, C3PO, Chewbacca, another Emperor-esque bad guy, another Empire-esque bad group, the claymation chess game, and a bar scene that is almost a facsimile of the bar scene in A New Hope is cool, but if one calls a spade a spade, it is really just a rehash of highlights and thus problematic for two reasons. First of all, this means the movie is largely unoriginal, which is annoying. It’s like, I paid $14 for a retread of ideas introduced forty years ago except repackaged and sold as a new film? We can do better than that. It’s also a little insulting. Do they think no one will notice the rewarmed leftovers mashed together into a bland casserole of a movie? C’mon, Disney. C’mon. Second of all, it makes the movie into what my friend Cary (a die-hard Star Wars fan) calls the film equivalent of a greatest hits album, something that led him to aptly rename the movie Star Wars: Greatest Hits. Of course, greatest hits collections are cool for an obvious reason: since they are a collection of the most popular songs released, they grant listeners the opportunity to hear a bunch of great tunes back to back to back. Look, two plucky heroes! And BB-8! The problem with greatest hits albums is that they signal that the band’s best days are in the past. Think about it – a band has a huge explosion of creativity and success such that, with each successive album, it is fundamentally moving and shaping the music world. Then, the band breaks up, the guys get older, musical trends change, and the group is no longer relevant outside of legacy tours. Time passes, and when it is clear that nothing else meaningful is forthcoming, the record company begins planning the greatest hits collection(s). It’s easy money – the band doesn’t have to do anything new, and lots of young, new listeners flock to the new album, eager to get a taste of the band they’ve heard so much about. It’s also safe – since the tunes have long since been vetted as absolute classics, there is no question about the music’s being panned or not. In the end, greatest hits collections work out for everyone involved – the record company makes guaranteed, easy cash, and new listeners get an introduction without having to go through an extensive backlog of albums. So, really, the only problem is (again) that a greatest hits album implicitly denotes that a band has nothing new to offer. Which is kinda a little bit saddening and frustrating for anyone wishing for something new and amazing. Applying that to The Force Awakens, its “greatest hits” feel gives the very strong impression that the franchise’s best days are past. Otherwise, we would have gotten a film that wasn’t just a retread of all the same elements. All said, it’s kind of lame. 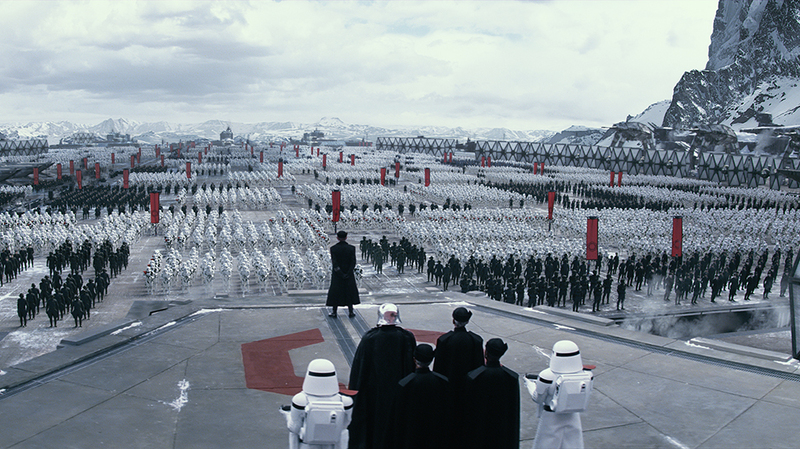 All bad guys in the Star Wars universe are actually the Nazis. Of course, since JJ Abrams is great at delivering flash without substance and repackaging old material as new, I suppose I can’t be too miffed. It would be inappropriate to be mad at a lion for killing a zebra – I might not like the spectacle, but that old lion is just doing what he was born to do. In the same way, JJ Abrams was born to make flashy, superficial movies that profligately reuse old material, so I shouldn’t be angry at him even if I don’t like the spectacle. Moving on, I guess I LIKED the soundtrack even though it, too, was basically a retread of the same themes from forty years ago. I love Johnny Williams, but if he’s going to just mail it in, maybe he should turn the reins over to someone like Michael Giacchino for the sake of the greater good. I mean, he’s bound to have made plenty of $$ by now; he should bow out gracefully and let the soundtrack go someplace new with someone new. Or, he should just buckle down and deliver the score of a lifetime. Actually, I want him to do this. C’mon Johnny – I know you have one more massively gigantic hit in you!!!! 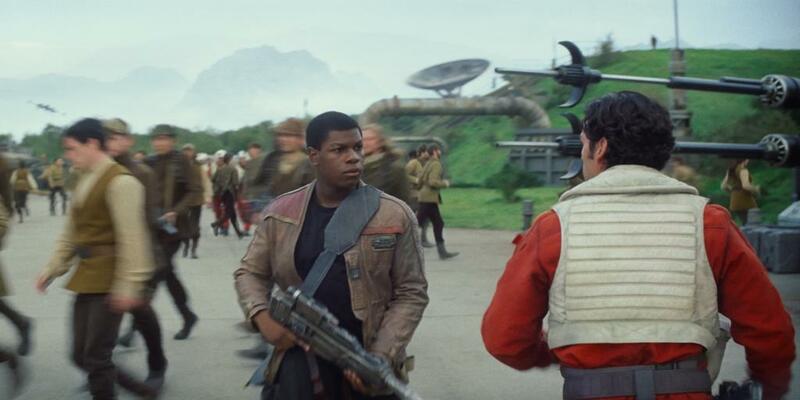 Hey look – it’s Finn and the back of that guy from Numb3rs! I DIDN’T like the exposition-laden dialogue, clunky character development or half-baked reveals. Again, this is Abrams so I guess I shouldn’t be surprised. For good measure, I LIKED BB-8. They really nailed it with that little guy. I could go on and talk about other things like Finn being an interesting new character, practical effects vs CGI and other things of that ilk, but I’m already over 2,000 words, and I fear some readers might already be breathing contumelies against me for my negative comments. Let’s finish this thing. By now, one might think that I hate this movie. It’s not that I hate it; I simply find it to have very little merit or rewatchability. It just isn’t very good. But, as I wrote in my review of Jurassic World, why try to make a good film when a mediocre one will make, in this case, $1.3 billion worldwide (and counting)? I told you, bro – I ain’t gonna cut myself if I hold it out like this! Grant Stevens is the annual winner of the annual “Grant Stevens’ Mind Palace Greatest Writer Ever” Award of Merit given to the greatest writer ever as judged by the writers for Grant Stevens’ Mind Palace. He is Le Roi of the Keep English Alive Society, and he chairs the Use Ironic Correctly Society. While not winning awards, he enjoys creating new awards to win, basketball and ice croquet polo. Nice article. The empire is just Nazi Germany, completely agree with that. I didn’t care that much for TFA. I guess it was OK. 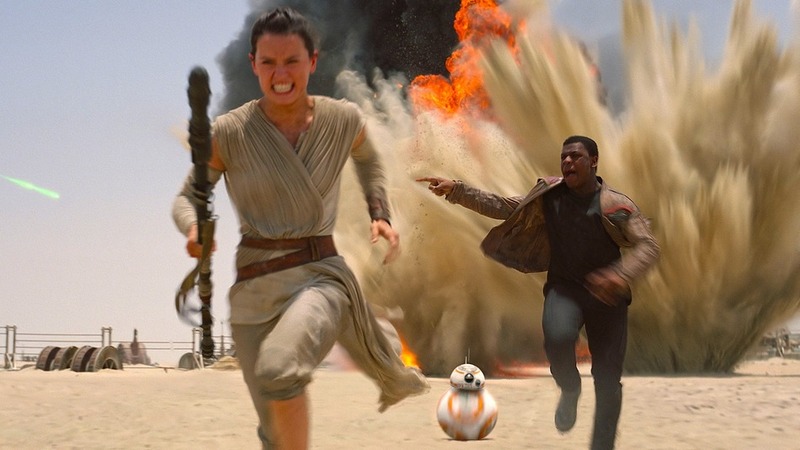 I though finn and Rey were pretty obviously political statements, and that was irritating.